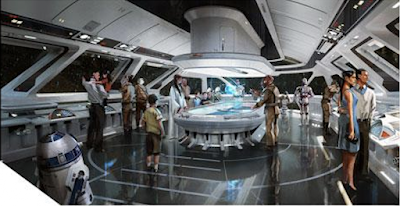 I haven't talked it over with my fianceé yet, but given the fact that Walt Disney World is planning Star Wars-themed resort that lets you live inside a spaceship, a permanent move to Orlando might need to happen. As reported by Walt Disney World News Today, the resort would immerse visitors in a two-day night interactive story involving live performers, lightsaber training and secret missions in Disney's Hollywood Studios' Star Wars land. This is of course in addition to an "on-board" cantinas, dinner shows, exclusive park access and droid butlers. The resort experience would cost roughly $1000 per guest, and would coincide with the anticipated Star Wars land opening in 2019. This information came to light thanks to a Disney guest survey about the forthcoming resort that was distributed by a third party. Naturally, people are excited. If this actually happens, the Force faithful will finally get the chance to legitimately live, eat, drink and breathe Star Wars for two nights. I know I basically do that every weekend, but never with droid butlers or actors dressed like Duros. For more details on Disney's plans for a Star Wars resort, head to wdwnt.com. This morning at Star Wars Celebration Orlando, director Rian Johnson unveiled the first teaser trailer for Star Wars: The Last Jedi, giving us our first glimpses of Rey's training, all-new vehicles and at least one new planet. "Glimpses" is the operative word here, as the trailer doesn't give us much (it's a teaser, after all), but that won't keep us from speculating on every frame until the next trailer hits later this year. Why is Luke determined to put an end to the Jedi? What are those cool speeders kicking up red dust? Why is Kylo Ren's helmet smashed? What's Finn's status after being slashed by a lightsaber in The Force Awakens? Is Captain Phasma still miffed about that whole trash compactor incident? Join me in excitedly adding question marks to the end of sentences by watching and re-watching the debut teaser trailer for Star Wars: The Last Jedi below.